Hear Leonard Nimoy speak six classic phrases from Star Trek: The Original Series! Entertainment Earth Convention Exclusive! Missing this individually numbered limited edition talking bobble head would be highly illogical! 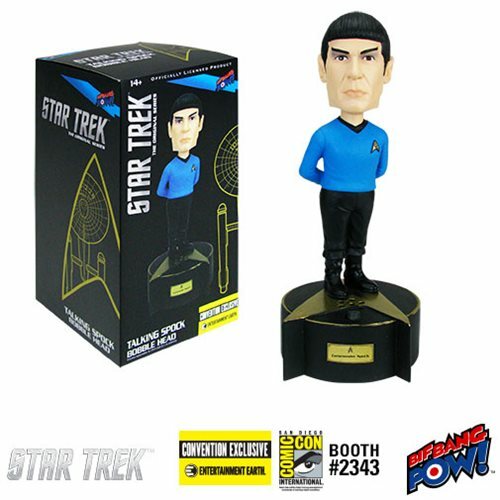 Right out of Star Trek: The Original Series, First Officer Spock stands 6 1/4-inches (not including the delta-themed base) as this resin Star Trek: The Original Series Talking Spock Bobble Head - Convention Exclusive from Bif Bang Pow!. At a push of a button, you'll hear Leonard Nimoy speak six classic phrases from the iconic TV series: "Highly illogical." "Fascinating." "Live long and prosper." "Vulcan's never bluff." "Insufficient facts always invite danger." And "Transporter room - ready to beam up." Wow! Ages 14 and up.